As I did “want one now” and I had bought a couple of packs I decided to go for the taste test. First thing to note these are as I remember them visually. There is a paper wrapper, over foiled paper which is true to the original and so very retro! Underneath the wrapper is a chocolate biscuit in three segments, each with the Trio logo on them. As I was looking the aroma of chocolate and toffee couldn’t help catch my attention, I really have missed these biscuits. I broke a piece off, with a snap, and bit in. The flavour of toffee is just wonderfully rich and strong. There is no comparison to caramel, this is a proper rich toffee flavour. It is delivered in a soft layer over the biscuit, it isn’t hard or gooey. 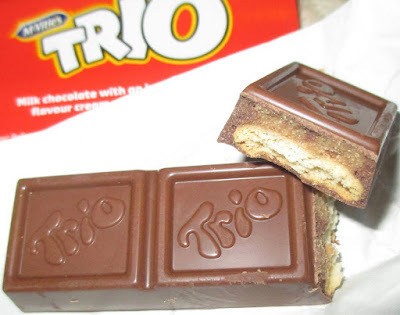 The chocolate is a nice thick milk chocolate and the biscuit is crunchy and tasty. I enjoyed my step back in time, and the rich toffee taste. I am so looking forward to having one of these in my (now work) lunch box. 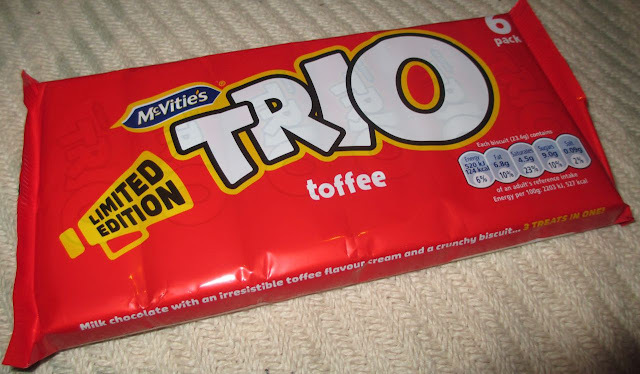 They’ll take me back to my childhood for a bit, and be perfect with an afternoon cuppa. I’m hoping McVities will see the light and make these permanent, the phrase Limited Edition isn’t very reassuring. 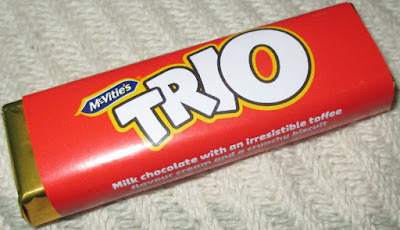 Can I ask when you found these as I've been trying to buy them but I haven't actually seen them since they said they were coming back?! I bought them a couple of weeks ago from Morrisons online - they are on offer for £1 a pack as they are new.